In this case study, we are a compressor manufacturer in the process of developing a new type of compressor. Our project team was charged with developing the design for the compressor using Design for Six Sigma (DFSS) tools and techniques. As we worked through the DMADV (Define, Measure, Analyze, Design, Verify) process, we used simulation and optimization to provide project justification, lend insight into the critical drivers of quality, and help create a cost effective design that meets customer requirements. For DFSS, critical benefits of simulation and optimization are the ability to prototype new products or processes without an appreciable investment of time or money, minimal defects, and sales driven through improved customer satisfaction. The first step in our Six Sigma process was to estimate the financial impact of this project. We started by developing a simple spreadsheet model (DFSS Case Study Define.xls) in Microsoft® Excel to take into account the greatest risks in developing this new product. We considered three major areas of concern: technical feasibility, manufacturing capability, and market uptake. 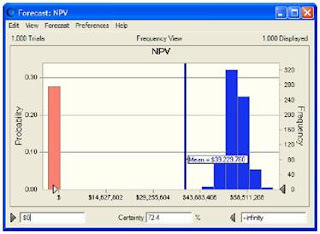 Once the model was complete, we used Crystal Ball® to define the variability or uncertainty around project elements (as probability distributions) and simulate potential outcomes (Figure 1). Using this model, we predicted a 72% overall probability of success. While the success rate for the product was not exceptional, the potential rewards of this project were great, compared to the relatively minor risk. 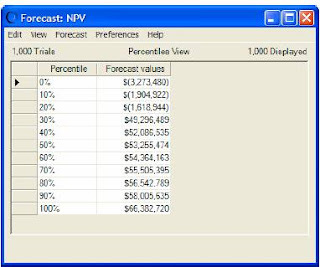 The percentile values of the NPV forecast shown in Figure 2 illustrate that the likelihood of losing more than $1.9MM was only 10% while the likelihood of creating an NPV of at least $49MM was more than 70%. Based on this information, the team and process leader decided to proceed with the project. We could have also developed models to forecast the projected timeline for the project and the required resources in the Define phase. In the measure phase, we needed to establish valid and reliable metrics to help monitor our progress towards the project goals. Our primary goal was to establish the Critical-to-Quality (CTQ) characteristics. Based on our customer feedback, we know the top CTQ is flow rate through the compressor. We built a model (DFSS Case Study Measure.xls) to calculate the flow rate from the input parameters. We applied Crystal Ball assumptions to each of the input parameters to describe their variability in previous systems. The data for these parameters were available from similar compressor systems our company had already designed. We then ran a simulation and viewed the Sensitivity Chart (Figure 3) for the Flow Rate, which we have defined as a forecast. The variability in the piston stroke length was the primary contributor to the variability in the mass flow rate. In order to produce compressors with the least variability in the flow rate (as desired by our customers), we had to minimize the variability in the piston stroke length of the compressor. Next, in the Analyze phase, we needed to determine our design options for the piston assembly. We developed a model (DFSS Case Study Analyze.xls) that calculated the piston stroke length using the pre-defined piston dimensions and user-defined Decision Variables for the nominal values of arm length and crank length. Decision variables are model inputs over which we have control and wish to optimize. Both simulation and optimization play an important role in the design analysis, and we needed to run an optimization on these two elements to ensure a proper design. Since the crank angle producing the maximum stroke length depends on the arm length and crank length, we wrote a simple macro that invokes Solver prior to each simulation to find this crank angle based on the two decision variables. The macro was called before each simulation through a setting defined in the Crystal Ball run preferences. We ran OptQuest®, the optimization tool in Crystal Ball Professional Edition, with the objective of minimizing the mean error from the target piston stroke length. We used OptQuest’s Solution Analysis tool (Figure 4) to analyze multiple designs that resulted in a nominal stroke length very near 30.80. The optimal stroke length had been determined earlier in the design of the compressor. OptQuest quickly identified five solutions that closely approximate the desired stroke length of 30.80, and these are the solutions we compared in the Design phase. In this phase of development, we designed the product so that it met customer requirements. With five possible piston assembly solutions from the Analyze phase, our goal was to choose the optimum quality design that was also cost efficient. The variation (uncertainty) in this design model was represented by the error in each of the five piston dimensions used in the calculation of piston stroke length. We defined these errors as normal assumptions. We then modified our compressor model to include cost functions and levels of machined quality for each of the five dimensions. Because we have control over the desired level of quality, we defined these five quality factors as decision variables. We also calculated total cost to produce one million in specification parts based on these quality costs and the simulated DPMO. As we increased quality (and decreased variability), our machining costs increased, so we needed our optimization to determine the lowest possible cost we could expect for the required level of piston quality. We ran OptQuest on the model (DFSS Case Study Design.xls), with the objective of minimizing the total cost to produce 1,000,000 in specification parts. OptQuest minimized cost by adjusting the nominal crank and arm lengths as well as the quality level of each of the five parameters that determine piston stroke length. The results are displayed below in Figure 5. The Performance Graph, shown in the bottom of Figure 5, is useful for gauging OptQuest’s progress. As the graph leveled off and remained unchanged, we deduced that OptQuest had converged on an optimal or near-optimal solution. OptQuest selected the third design solution with a total cost of $17 million, which met our cost expectations. But did this final design meet customer requirements? The Verify phase required us to check that the customer needs were satisfied. We copied the optimum design parameters back into our Excel model and ran the simulation for 10,000 trials. We found that with these design parameters and specification limits, only about 84% of our production would be within the specification limits. While the economic analysis indicated that this was the most cost-effective solution, we were charged with designing a piston assembly that provides 95% certainty of a stroke length between 30.70 and 30.90. To solve this problem, we returned to OptQuest one last time. With this in mind, we ran the optimization again, this time with a requirement of 95% certainty that the stroke length was within the specification limits and the objective of minimizing total cost to produce 1,000,000 in specification parts. The resulting optimization is shown in Figure 7. This new optimization, which selected design solution 1, was successful. While the costs rose to $24 million, we ensured that 95% of the piston assemblies would produce a maximum stroke length within specifications. Based on this design, our company created a compressor with few defects and our customers were satisfied. 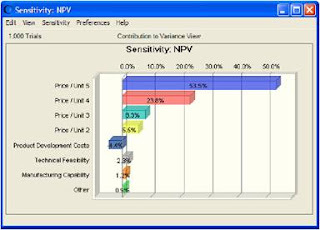 Monte Carlo simulation and optimization have a crucial role to play in all phases of a Design for Six Sigma project. Without the ability to run simulations, spreadsheets alone can provide only a limited understanding of the variability surrounding a process or project design. Crystal Ball Professional Edition overcomes the limitations of spreadsheets by enhancing Excel with user-friendly tools for Monte Carlo simulation and global optimization. By moving to a probabilistic methodology, DFSS practitioners can better quantify the effects of variability and implement robust product designs with greater insight and confidence. For more information on how Crystal Ball is used for Six Sigma, visit the Crystal Ball Web site (www.crystalball.com/sixsigma). Product Quality Planning is a structured method of defining and establishing the steps necessary to assure that a product satisfies the customer. The goal of product quality planning is to facilitate communication with everyone involved to assure that all required steps are completed on time. • To direct resources to satisfy the customer. • To promote early identification of required changes. • To avoid late changes. • To provide a quality product on time at the lowest cost. Quality Planning Cycle, the better. Six Sigma only applies in a manufacturing environment. 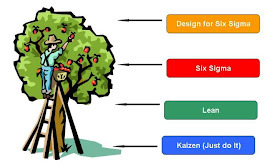 Six Sigma provides tools that enable teams to improve any type of process, both continuous and transactional. Six Sigma is too complicated and requires a Ph.D. in Statistics. Breakthroughs in desktop software and improved courseware enable teams to complete complex analysis and experiments quickly and easily. Six Sigma projects can go on for months with no clear gains assured. Clear project charters, upfront financial benefits analysis, and executive accountability ensure timely completion of projects as well as significant financial returns on every project. Six Sigma projects add to employee overload. Project prioritization and continuous management review ensure the optimization of team resources. 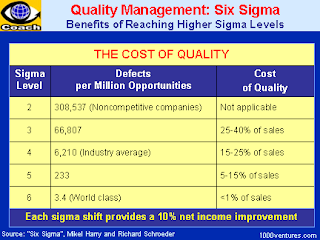 Six Sigma primarily focuses on cost reduction. While cost reduction is usually an important outcome, all projects first focus on meeting critical customer requirements. Six Sigma programs create more "initiative of the month" confusion. Six Sigma can be the integrating force that brings current initiatives into alignment and focuses all initiatives on breakthrough business improvement. Six Sigma is just another name for TQM. While Six Sigma utilizes many TQM tools, these tools are applied for breakthrough business improvement and sustainable financial returns. 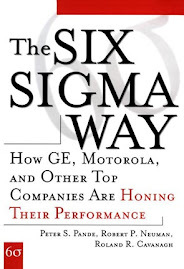 Six Sigma requires heavy investment, with no clear line of sight to return on investment. Manufacturing Samples and the resultant data have to represent the total population, yet processes controlling the population are often changing dramatically, due to people, shift, environment, equipment, etc. Sales Sales forecasts often use sampling techniques in their predictions. Yet the total market may have many diverse groups to sample. These groups may be affected by many external drivers, like the economy. Marketing What data should be used to judge a marketing campaign's effectiveness, since so many other factors are changing at the same time? Software Development What are the main causes of software crashes and how would you get data to measure the "crash-resistance" of competing software? Receivables How would you get good data on the effectiveness of a program intended to reduce overdue receivables, when factors like the economy exert a strong influence and change frequently? Insurance How can data measuring the satisfaction with different insurance programs be compared when people covered by the programs are not identical? Many parts have to fit together to make a product, like a cell phone. When engineers design the parts, they account for the fact that all parts will display some amount of variation as they are produced. Variation is the degree to which a part, product, service, or transaction differs from all others in the same class or category. In the case of a phone, each class of parts, like the plastic casting, vary in size, weight, and even color. Just as the phone cases vary, so does the clear plastic display that covers the liquid crystal display. Then you have the many hinges, buttons, antenna, internal component, and so on. All these parts have to snap and fit together well if the phone is to perform its function to your satisfaction. In other words, you can only tolerate a certain amount of variation. A little too much variation and the phone won’t work property. A little more variation and it won’t work at all. And we all know who’s going to end up with the bad phone, right? Value Stream Mapping is a Lean technique used to analyse the flow of materials and information currently required to bring a product or service to a consumer. At Toyota, where the technique originated, it is known as "Material and Information Flow Mapping"
Draw a current state value stream map, which is the current steps, delays, and information flows required to deliver the target product or service. This may be a production flow (raw materials to consumer) or a design flow (concept to launch). There are 'standard' symbols for representing supply chain entities. ----------------------------- Six Sigma has been labeled as a metric, a methodology, and now, a management system. While Green Belts, Black Belts, Master Black Belts, Champions and Sponsors have all had training on Six Sigma as a metric and as a methodology, few have had exposure to Six Sigma as an overall management system. Reviewing the metric and the methodology will help create a context for beginning to understand Six Sigma as a management system.